Pull the Plazer's Instant Destruct Trigger and See Your Target Destroyed! 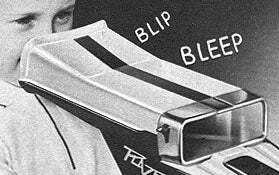 Direct to you from the pages of the 1966 Montgomery Ward Christmas catalog comes the Plazer, the bleeping, blipping transistorized ray gun of the future. Even though the Plazer's "ray beams" were contained "safely inside the gun," it's doubtful you'd see the words "'Hit' a plane" advertising anything today. Click through for all the Plazer's specs. P.S. $8.88 in 1966 is equivalent to roughly $57.00 today.